You have the book examined and you ask a member of the audience to tell you how many pages there are in the book. They might say that there are 216 pages in the book. You then ask them to give you a number between 1 and 216. Whatever number is offered to you, you tell them that the number will be used to select the page, the line on the page and the word on the actual line. This is all you have to do and you will be able to tell them the line and the meaning of the line. When Martin Breese decided to perform this effect in front of an audience consisting of two university professors, the director of the Edinburgh Festival, a famous poet and a leading portrait painter he took off two hours before the performance to learn a couple of things. The effect on his highly intellectual audience was one of stunned silence. For what seemed to be about five minutes there seemed to be a stunned silence. Every single person to witness the effect was completely blown away. Martin Breese rated this as one of the four best effects that he has ever performed. They are all book tests and they are all brilliant. 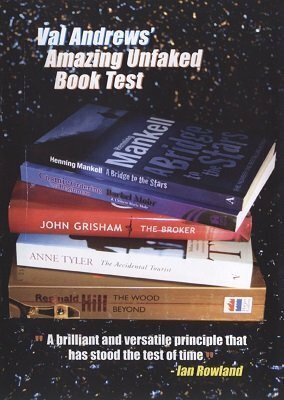 The book test by David Hoy which uses two unfaked books freely chosen, the Master Key by Terri Rogers and the classic Chan Canasta book test as described in Vol. One of David Britland's masterful book on Chan Canasta. Val Andrews originally released this as a rather tacky and badly designed photocopied booklet. Martin Breese has printed a beautiful color booklet designed by his close friend Paul Griffin.